I recently discovered a recipe for “Vanilla Pops” in Cece’s Highlights magazine. Usually these recipes are not even worth glancing at, but this one looked decently healthy (once manipulated a bit) and delicious. Popsicles are an obvious favorite when its hot outside but they can be eaten year round…and the BEST part is, they can be healthy AND keep your child busy for a good 20 minutes. And she’ll enjoy making them with you! Rather than the traditional sugar on a stick recipe, try these healthy alternatives. 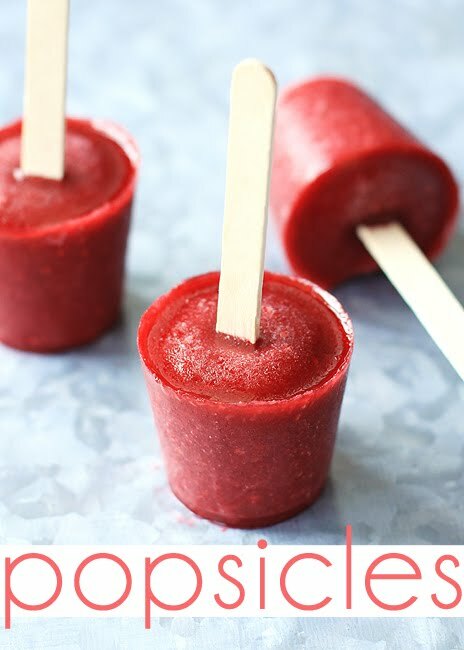 All you’ll need to make the popsicles is dixie cups (or paper cups) and craft sticks/popsicle sticks. No fancy popsicle mold needed. Blend ingredients together in a blender. Fill each cup about 1 inch. freeze for 1 hour. Take them out from the freezer and place the popsicle stick in the middle of the cup. Freeze for another couple hours until completely frozen. Peel and enjoy. Blend up your most favorite smoothie recipe. I like to add hemp protein powder or almond butter for added protein. This one is easy! Simply water down juice and freeze!